It’s amazing how quickly ten years can just fly by. It seems like just yesterday when we were reading about this new band called As I Lay Dying and their debut album Beneath the Encasing of Ashes that had just been released. The band quickly won over fans and respect from the critics and other artists. They were a part of Warped Tour, Ozzfest, Soundwave Festival and many other huge shows. They also toured with such heavyweights as Disturbed, Slipknot and Lamb of God. 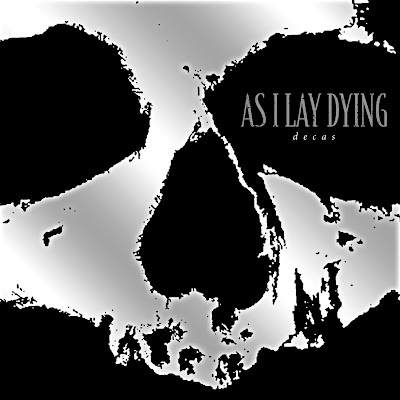 Now, here we are 10 years and 4 more studio albums later and As I Lay Dying are celebrating. To commemorate their anniversary, the band has released a new album to say thanks to their loyal fans. Decas consists of 3 new songs, 4 covers, 1 re-recorded medley and 4 remixes. It’s a mixed bag of tricks that is sure to satisfy all levels of As I Lay Dying fans. The album opens with “Paralyzed”, which is in the same vein of where the band was on their last album Powerless Rise. This song will definitely wet the appetites of fans who are anxiously awaiting a new studio album and tour. “Moving Forward” is cut from that same musical cloth and will not disappoint the listener. Cover songs; some people like a band to put their own spin on them while others like for the band to stay true to the original. The band covers Slayer’s “War Ensemble” and totally, no pun intended, slays it. Tim’s vocals on this song fit just like a glove. Next, the band attacks “Hellion” and “Electric Eye” by Judas Priest and produce a result that even the rock icon Rob Halford would give a horns high salute to. The last cover is a 35 second insane spin on the Descendents’ “Coffee Mug”. The medley, “Beneath the Encasing”, contains parts of several songs from their debut Beneath the Encasing of Ashes. As for the remixes, the band takes one song from each of their releases since Frail Worlds Collapse and I have to admit that there is some very bizarre territory being explored there. They seem a bit bizarre to me for some reason. I’m just not feeling them at all and I don’t think that they bring much to the table. It’s nice for a band to explore new territory and try to expand their horizons, but I am not sold on these remixes. In a world of the ever growing dubstep craze, I think this is a step backwards for the band. I’m just glad it’s for this special album and not a new musical direction for the guys. Decas is a really solid album, minus the remixes, from the band. The musicianship on the new songs and covers is tighter than the band has ever sounded. Tim Lambesis’ growls are more aggressive than ever and very dark at times. Josh Gilbert’s clean vocals offer a great balance and contrast to Tim’s. This album is something for the fans and is not meant to take the place of a new studio album. If the three new songs are any indication of where the band is headed, then their follow-up to 2010’s Powerless Rise is going to be one of the most anticipated releases of the year.